/Design Tools - Artwork and Embellishments /How do I find embellishments? To find embellishments, follow the steps below. Locate the “Artwork” tab in the vertical toolbar on the left side of the Design Center. This will open up a library of embellishments that are already in the design, and will give you an option to search for other embellishments. 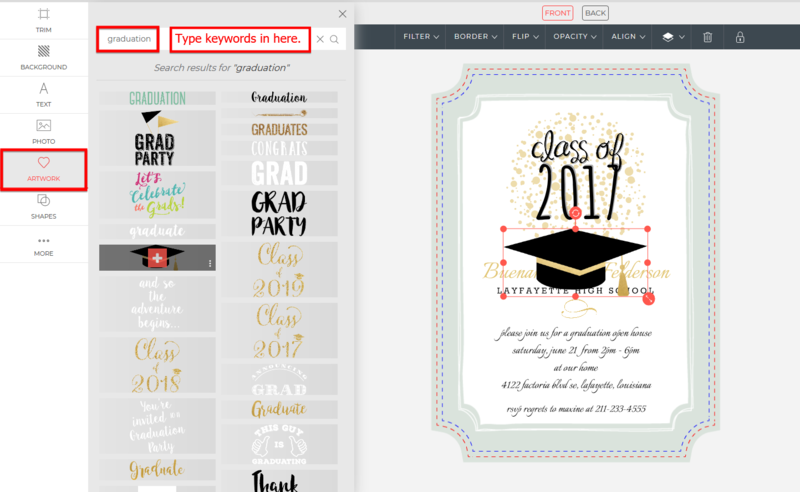 Type a keyword into the search bar and click “Search.” Some examples of keywords are: flower, birthday, graduation, and banners. You can also type the word “all” to search through all embellishments. Select the embellishment you like by clicking the Plus sign that appears over it. The embellishment will be placed on your design. Modify and place embellishment as needed.